I made this unique tasting malt while trying to make a Brumalt style malt from store-bought Pale malt. I can’t think of another name for it because brown bread with honey on it is what it tastes like. Brumalt starts out differently than pale malt so making it from a Pale is not actually possible. It’s steeped to a higher moisture content, germinated at warmer temperatures and has a stewing phase before kilning, but I was curious to find out what would happen if I soaked a pale malt till it had about a 50% moisture content and ran it through a kilning schedule that’s similar with an emphasis on activating the proteolytic enzymes. 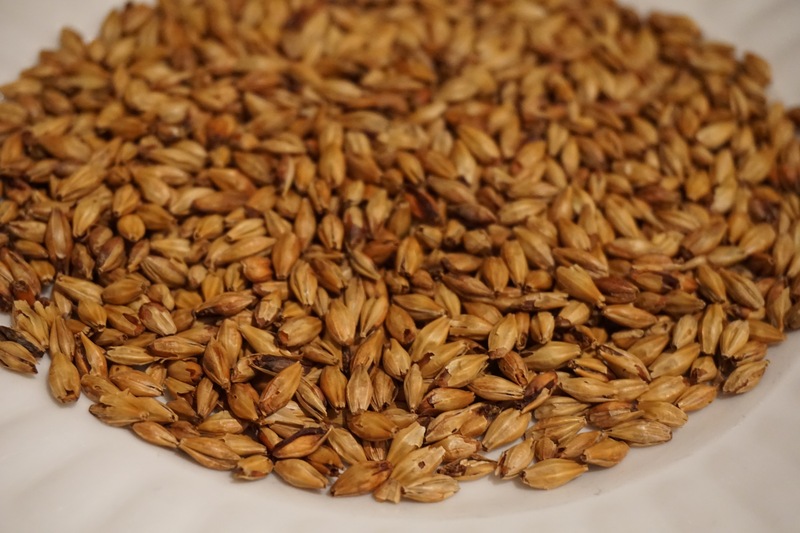 A good way to soak pale malt is to add just enough water so that it will be around 50% after absorbing it. This way no enzymes or sugars get washed down the sink. Make sure to keep it cool. After the malt absorbed almost all of the water I drained the excess and then stewed it for 36 hours on a tray covered with tin foil (8 hours 30-40C then 24 hours 40-50C). I then dried it at low temperatures 35-50C on a screen with a fan on for the first seven hours then off for the next 15. After 22 hours of drying it was down to its original weight so I cured it for 3 hours at 190F. What I noticed when using pale malt is that it dries faster than regular malt. Since it has been kilned once already the outer layers are now friable and allow an easier passage of moisture. Likewise, Pale malt also absorbs water faster than barley so it takes one steep of 12-14 hours to attain about a 50% moisture content or 24 hours using the absorption method.